Fort Myers. February 24, 2011. Weary travelers arriving at Southwest Florida International Airport are met with an American flag whose dimensions are 18 feet by 10 feet. In the wide open spaces of an airport concourse (terminal D near the luggage security check), an oversize flag might not seem unusual. But this is no ordinary flag. 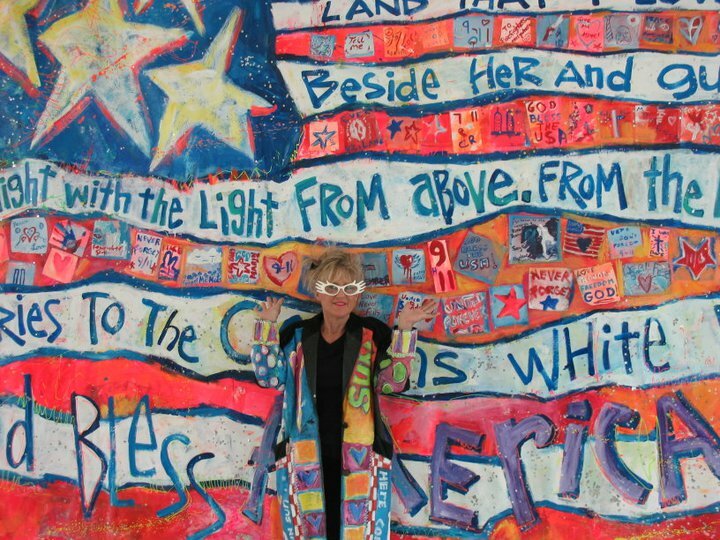 The flag was painted by Leoma Lovegrove on Sept. 11, 2009, during an event to commemorate those who lost their lives in New York City and to honor those who conducted rescue efforts. The lyrics of "God Bless America" are emblazoned on the flag itself. Surrounding Lovegrove's work are smaller canvases painted by audience members who seized the opportunity to express their own feelings about that historic day. The flag will hang at the airport until Sept. 2011. On the tenth anniversary of the attacks, Lovegrove will again Paint Out Loud at Broadway Palm Dinner Theater. An artist's reception at the airport is being planned.